All fields fall with distance from the source. It is often convenient to express this as a power law: the field falls as the inverse "nth" power of distance. These are only simplifications and in the rest of this page we give more detail. Note that in every case the field still falls with distance - we are just discussing how rapidly it falls. In more detail: the field produced by each circuit is a horizontal dipole (n=2). With sloping circuits, the dipole can be resolved into two dipoles: the larger one still horizontal and a smaller vertical one expressing the small amount of slope. The horizontal components from the two circuits are exactly anti-parallel: this produces a quadrupole with n=3. The two small vertical components are parallel and produce a dipole with n=2. 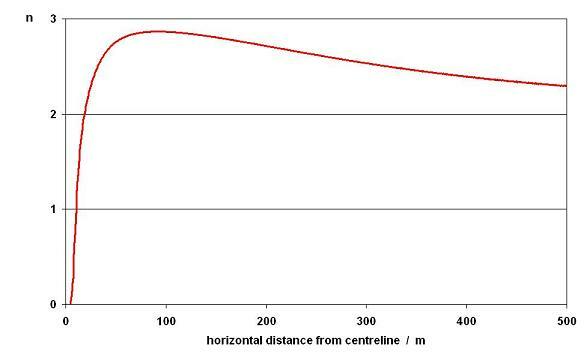 At smaller distances this dipole field is small compared to the quadrupole component and overall n is still close to 3. But at large distances, the n=2 dipole component, which falls more slowly with distance, ends up dominating the field and n tends towards 2. In more detail: again, the actual currents resolve into a component which is equal in both circuits plus a component expressing the unbalance. The balanced component of current produces a quadrupole field with n=3 and the unbalanced component of current a dipole field with n=2. At smaller distances the balanced component is larger in this instance, but at larger distances the n=2 component dominates over the n=3 component. In more detail: the sum of the zero-sequence current in each circuit plus the earth-wire current produce a small overall net current in the line which has n=1. But this net current induces an image current in the ground itself. The depth of that image current depends on the ground resistivity - the more resistive the ground, the deeper the current. 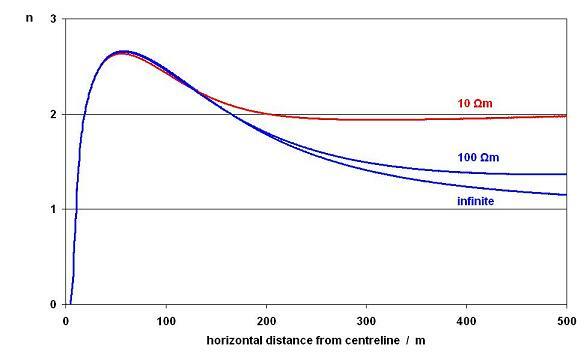 At small distances from the line, all these out-of-balance currents produce fields which are small compared to the load current, and the power-law is determined by the load current. 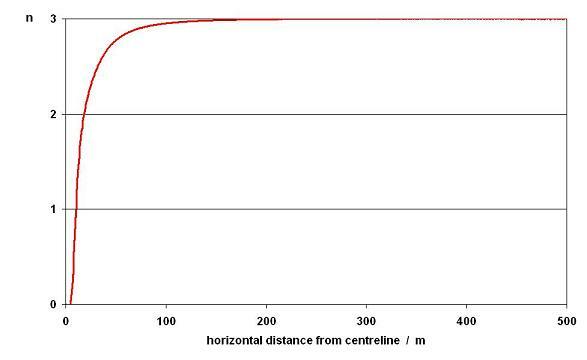 At very large distances - large compared to the depth of the image current in the ground, which can be many hundred metres - the net current in the line and the image current in the ground form a dipole with n=2. 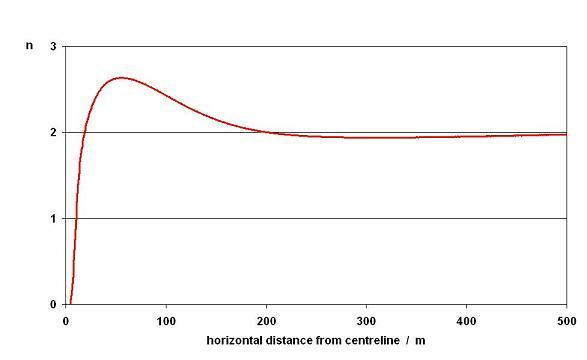 At intermediate distances, you can be close enough to the conductors for the n=1 of the net current to be important, but too far away from the image current in the ground for that to be important, and the overall n dips below 2 before rising back to 2 at larger distances. The following graph illustrates this for three different ground resistivities. 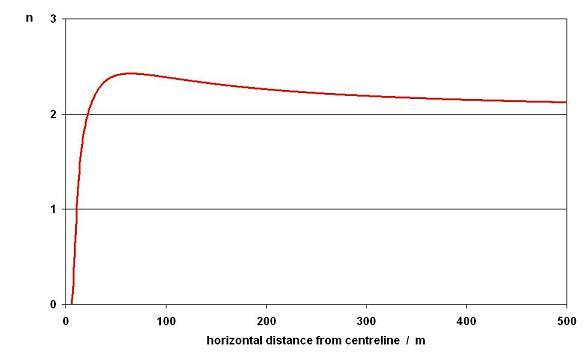 The 10 Ωm curve - image depth 230 m - barely dips below n=2. 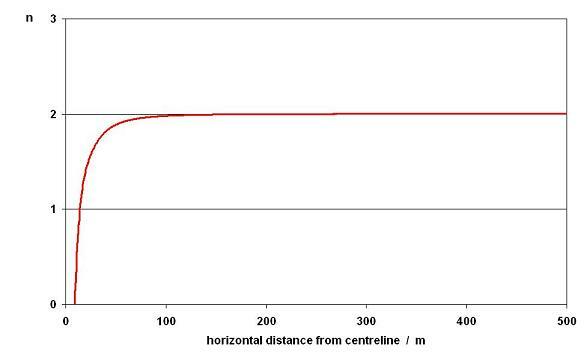 The 100 Ωm curve - image depth 720 m - is just starting to rise. For infinite resistivity there is no image current and n tends towards 1.